Whether you have an elevator in your office building or inside your home, Carson Elevator of Salt Lake City can provide you with peace of mind knowing that your lifts are safe. We provide regularly scheduled elevator maintenance plans that include thorough inspections of your equipment to make sure all of the elevator components are in tip-top shape. Not only does this ensure the safety and reliability of your elevators, but it can also save you money in the long run by preventing major elevator repairs. All of the elevator service technicians at Carson Elevator are highly skilled and bring years of experience to the team. You can cancel your elevator maintenance plan at any time with no additional costs or fees. And should your elevator ever need to be repaired, we use the highest quality parts and promise speedy repairs to get your elevator back up and running as quickly as possible. To learn more about elevator maintenance plans in Salt Lake City, contact Carson Elevator toll-free at (888) 371-1948. 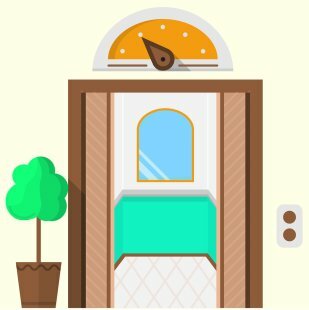 Although elevators are common in offices and gaining popularity in homes, it wasn’t that long ago that the elevator was one of the most magical and mysterious machines people had ever encountered. Invented by a man named Elisha Graves Otis in 1861, the elevator played an important role in the rising height of buildings around the world. After all, do you think anyone would want to climb 102 stories to reach the top of the Empire State Building? Although commercial and residential elevators might not appear as magical today as they did in the 19 th century, they might be just as mysterious. That’s why we’ve devoted this short blog post to looking at elevators and how they work. One of the most important components that helps an elevator do its job is the counterweight. The elevator car is balanced by a heavy counterweight that weighs roughly the same amount as the car when it’s loaded half-full. This makes it easier for the motor to lift and lower the car since less force is needed to move the car up or down. The counterweight also makes elevators safer since it reduces the amount of braking the elevator needs to use. Speaking of brakes, elevators are equipped with a safety brake system that prevents the car from crashing to the floor should the main cable snap. This was one of the breakthrough innovations Elisha Graves Otis made when he invented the modern elevator more than 150 years ago. Elevator cars run between two vertical guide rails with sturdy teeth embedded all the way up. In the event that the cable snaps, a spring-loaded mechanism shoots out hooks which ham into the metal teeth and lock the car safely in position. Another important safety feature that is also critical to the operation of an elevator is the speed governor. A heavy flywheel with massive mechanical arms built inside it, the governor ensures that the elevator car doesn’t rise or fall too quickly. In the event that the car accelerates past a safe speed on its way up or down, the governor activates and trips one or more braking system to slow down or stop the car altogether.